– Joshua Holland, “6 Ways the Rich Are Waging a Class War Against the American People,” AlterNet.org, Sept. 25, 2011. Here’s the real conundrum faced by the current loud and feckless Tea Party incarnation of the GOP: they want people to work for a living when there aren’t enough jobs, but think it’s ‘evil socialism’ for the government to provide jobs for the unemployed who want to work (and stimulate the economy by their spending). The wealthy and corporations have received massive tax cuts over the last decade, with some corporations like GE and ExxonMobil paying no federal income taxes at all – if tax breaks are ’job creators’ as the neoconservatives claim, where are the jobs? 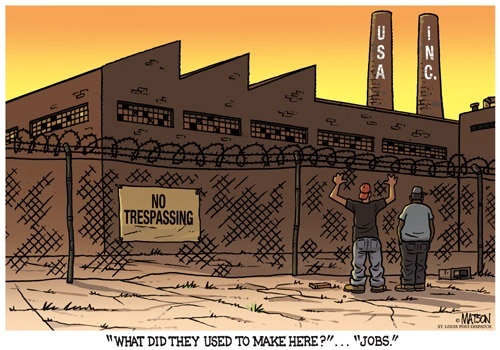 This entry was posted in 2012 Election, Christopublicans, Conservatives, Corporations, Economy, Idiots, Politics, Quotes, Republicans, Teabaggers, Wall Street, Wingnuts and tagged Cartoon, ExxonMobil, General Electric, Job Creators, Jobs, RJ Matson, Taxes. Bookmark the permalink.